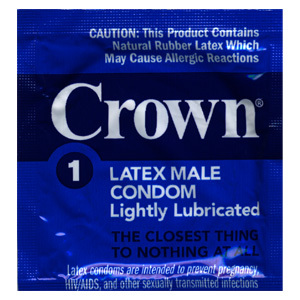 Crown Lubricated condom - NEW FOIL! Crown condoms, the closest thing to nothing at all. This condom is non-contoured with a reservoir tip and has a slight coral tint that appears clear when donned. Note the manufacturer now ships this condom with a new blue themed foil! DISCONTINUED - ID Moments Warming Sensual Lubricant 2 oz Bottle w/pump -NEW Bottle Style!